This is the latest watch in the Jochen Benzinger collection and is an elaborate display of old world craftsmanship and artistic ingenuity. 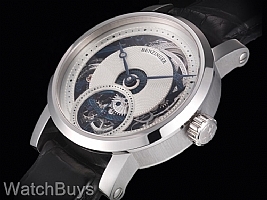 Based upon the original Zeitfenster design, the new Jochen Benzinger Zeitfenster II (Time Window) shows a unique "window" into the workings of the hand skeletonized mechanical movement where the chapter ring or hour numerals would typically be found. Surrounding the hand guilloched sterling silver dial at the center is a ring that has been "cut out" to reveal the skeletonized blue platinum plated movement beneath. The Breguet hands are in steel and flame blued by hand. 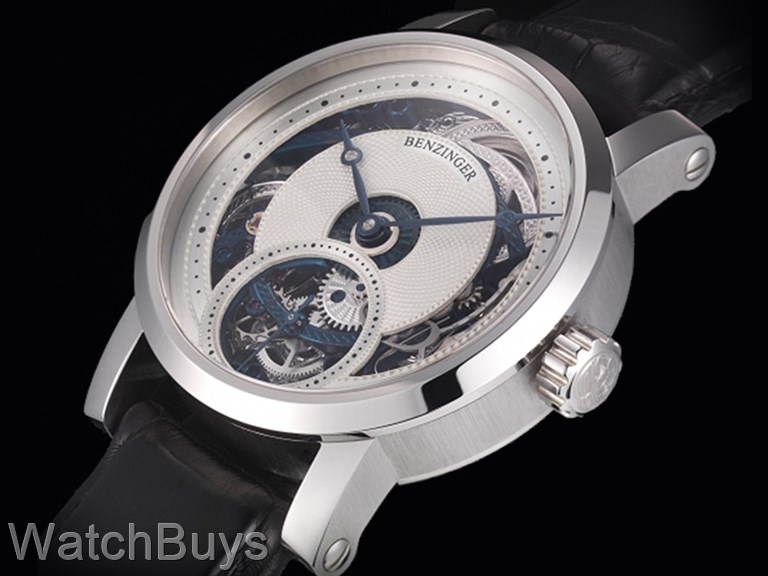 This watch is made using traditional Pforzheim techniques (click here to learn more about these machines and the manufacturing process). The process of making just the dial can take days. Next, he cuts out portions of the dial using a small engraver's hand saw. These cuts must be perfect - one slip can ruin the dial which has already been guillochéd. This watch like all of Jochen's watches is one watch that you will want to turn over to show what a true artist can accomplish. This watch is manually winding with a power reserve of 44 hours, and features a large sub seconds hand at 6. Sapphire crystals on both sides with screwed balance. The presentation box is elaborate, and naturally features engraved plates describing and naming the watch. This watch ships with a Benzinger calf leather strap and Benzinger engraved double deployant buckle.